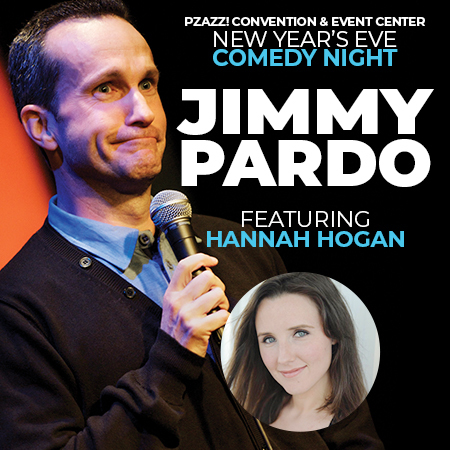 Tickets | New Year's Eve Comedy Show Featuring Jimmy Pardo and Hannah Hogan | Pzazz! Relax, sit back, and send 2018 out exactly the way it deserves... with lots of laughs! Join us at the PZAZZ! Convention & Event Center on December 31 for our New Year's Eve Comedy Show, featuring Jimmy Pardo and Hannah Hogan! In 2006, Jimmy Pardo became a podcasting pioneer when he began hosting the raucous-but-smart weekly podcast "Never Not Funny," which Entertainment Weekly called "one of the sharpest and gut-bustingest shows on the Internet." The show has been named a top comedy podcast by The AV Club, Esquire, GQ and USA Today, and its guest list (Jon Hamm, Zach Galifianakis, Amy Poehler, Tom Bergeron, Paul Reiser and Sarah Silverman, just to name a few) reads like a Who’s Who of Hollywood. Never Not Funny also hosts the annual Pardcast-A-Thon fundraiser, a 12-hour marathon webcast to benefit Smile Train. To date, the Pardcast-A-Thons have raised over one million dollars for the charity. Hannah is an All American Girl who’s actually Canadian, based in Nashville Tennessee. She spent the first chunk of her life in Canada - not her fault - and then moved to Nashville in pursuit of her dreams and a guy who she later, somehow, convinced to marry her. She starred in two Canadian TV comedy shows, "That's So Weird" and "Meet the Family." Hannah also trained and performed with "The Second City" live stage show in Toronto. Hannah works across the USA and Canada performing stand up comedy. She has performed at Limestone Comedy Festival, The Laughing Skull Comedy Festival, and Just For Laughs 42. In 2018, Hannah's stand up was featured on America's Got Talent. She records a podcast with her comedian husband called We’re Having a Good Time, and she's also a no nonsense, Adderall-fueled life coach (hence the run on sentence! ).